In July, I put up this post: Three Twitter Analytics Tools. At that moment, I had just been using this new Twitter analytics tool called Crowdbooster for a couple of days. I’ve had the chance to really put it through its paces over the last six weeks, and I pretty much think it might be the greatest thing since sliced bread. And here’s the good news: on August 31, Crowdbooster moved from private Beta to public Beta, which means you can (and should) get in on the action. Almost since the invention of Twitter five years ago, have we been looking for ways to prove Twitter’s ROI. What is any one given person’s Twitter reach? Who are the people that RT you the most? Who are the people on Twitter that are influential who are following you (and whose relationship you should be cultivating)? What are the best times of day to tweet? All good questions, right? Well, Crowdbooster has the answers. Works with your Twitter account. No matter how you access it. I like Hootsuite and all, but there are some features that other Twitter clients have that work better. For example, when I want to reply to a bunch of individual tweets with one tweet, Seesmic allows me to do that by just clicking the @ symbol on each of their individual tweets. With Hootsuite, I can only do that once, and then I have to copy/paste the rest of the usernames, or type them out. So, I use a mashup of different tools to access Twitter: the Twitter.com interface, Seesmic, Hootsuite, and Twitter for iPhone. Crowdbooster keeps track of all of my tweets, no matter where I tweet from. 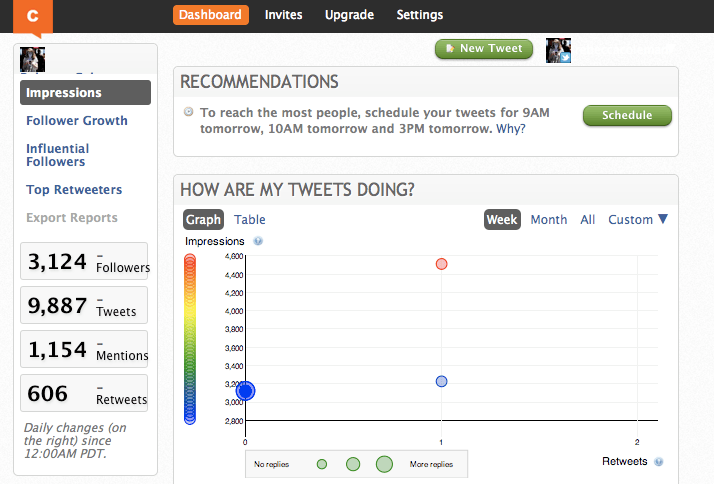 With Hootsuite, it only tracks tweets that I have tweeted via Hootsuite. Shows your reach: RTs and Replies: Crowdbooster sends you a weekly report, but you can also see how you have done in the last month, or for all time. It tracks how large your impressions for each tweet are: for example, I have just over 3,000 followers, and if one of my followers has 2,000 followers, and RTs one of my Tweets, my Impression score is 5,000. Tracks followers: You have individual tabs for tracking follower growth, seeing who your most influential followers are, and seeing who RTs you the most. Good information to know: those are relationships you want to nurture. Ability to manage multiple accounts: Crowdbooster runs analytics on both Facebook and Twitter, and you can add multiple accounts for each. Best times of the day to post: Crowdbooster analyses how your tweets do, and based on that, tells you the best times of the day to schedule your tweets. You can even automatically schedule them in through Chrowdbooster. Recommendations of top influencers to follow: This is by far my favorite thing that Crowdbooster does. It recommends people either to follow back (that are following me) or to interact or engage with people that I am following based on their Klout score. You can follow back or @mention someone from right inside the program. If you are at all interested in learning about how to Tweet better, leaner, faster, harder, get yourself a Crowdbooster account.